Volunteers of the Year Judy Eurton and Bill Riley were recognized for their comfort and care measures for cancer patients and their families at Emory Saint Joseph's Hospital. 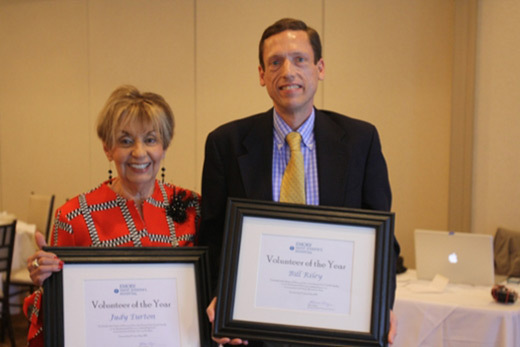 Emory Saint Joseph’s Hospital Auxiliary named Bill Riley and Judy Eurton Volunteers of the Year at the annual Auxiliary luncheon, recognizing both individuals for their comfort and care measures for cancer patients and their families at the hospital. The Volunteer of the Year is selected by Emory Saint Joseph’s staff who nominate volunteers exemplifying the Auxiliary mission, which is to support the hospital and patients, consistent with the philosophy of the Sisters of Mercy; show love, kindness and faith to every member of the community; bring comfort and hope to all who are in distress; and wisdom, humility and commitment to serving others. Riley, the Auxiliary’s vice president of patient support, contributed more than 450 hours of service in the hospital’s Winship Cancer Institute during an extensive expansion to accommodate the growth in cancer services at the facility. Riley worked tirelessly at the Winship Welcome Desk to make sure things went smoothly for several hundred Winship patients treated daily as well as support the staff during ongoing construction. Eurton successfully co-chaired the Auxiliary’s Light of Love, an annual fundraiser that raises thousands of dollars through the sale of Christmas lights purchased in honor or memory of loved ones. All proceeds from the Light of Love are designated by an honoree to be used at Emory Saint Joseph’s. Additionally, Eurton also comforts patients and staff by easing their anxiety in stressful situations through her work at the Ed and Dora Voyles Breast Health Center. Also during the event, Auxiliary volunteers were honored for their years of service as well as number of service hours contributed. Helen Faser was recognized for 40 years of volunteer service to Emory Saint Joseph’s, and other volunteers were honored for achieving milestone service hours ranging from 300 to 24,000 hours. Since the organization’s inception in 1951, volunteers have logged more than 1,123,000 hours of service. Auxiliary members work in several areas of the hospital including transportation, admissions, greeting patients and families arriving for surgery or doctor’s appointments, providing directions for visitors on campus, operating the gift shop and assisting nursing units and physicians. In 2016 alone, Auxiliary members served more than 55,445 hours – the equivalent of almost 30 extra employees at Emory Saint Joseph’s. “Every hour and every minute that our volunteers serve makes a difference in the lives of our patients, families, staff and physicians at Emory Saint Joseph’s,” says Allison Hager, director of Guest and Volunteer Services. For more information about volunteering with the Emory Saint Joseph’s Auxiliary, call 678-843-7292.